Located along the Stollberger Straße, Die Neue Synagoge Chemnitz is a synagogue that was built in the year 2002. Named as the New Synagogue (Chemnitz), the Old Synagogue on St. Stephen's Square was destroyed in 1938. The New Synagogue has been designed by the German architect Alfred Jacoby together with the local Jewish community and has been designed in a shape of a conical ellipse with glass domes and a steel roof. This new synagogue building can accommodate 300 persons. The ground floor houses a synagogue room with Almemor and Thorabereich, a dining room, a kosher kitchen, office, and a library. On the first floor, you will find classrooms, senior citizens' club, and a gallery. How popular is Die Neue Synagoge? 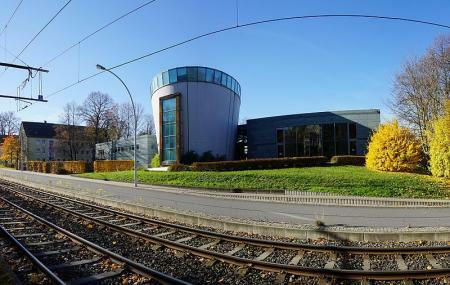 People normally club together Zentralbibliothek and Die Theater Chemnitz while planning their visit to Die Neue Synagoge. Gedenktag des Holocaust. Keine Vorwürfe, kein Hass, keine Rache. Nur Traurigkeit.